Isherwoods produce a wide range of Manuals, including its own User Manuals, other Operating Manuals and Technical Publications using a variety of hardcopy or electronic formats to customer specifications. By using professionally qualified engineers as technical authors we provide the sound technical expertise necessary for our technical publications. Our engineers have marine, mechanical, electrical, electronic, weapons and logistics skills. Isherwoods technical publications allow owners and operators to satisfy all requirements of their national Government departments, international agencies eg. International Maritime Organisation (IMO) regulations, classification societies or other relevant bodies. Isherwoods manuals also provide an ideal training reference. We are happy to provide quotations on request for Operating Manuals and other Technical Publications for any defined systems or installations. Isherwoods operating manuals and handbooks have the big advantage of including the operation of complete systems, 'as fitted' , including all the integrated equipment needed to enable operations personnel to carry out their duties safely and efficiently. In contrast to this most manufacturers manuals do not provide this information and describe only the operation of their own item of equipment without regard to the system in which it is fitted. We particularly consider the fact that equipment and components from many manufacturers are designed to meet specific operational requirements of a system during building and are linked in a manner unique to each project. 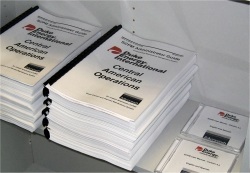 User manuals cover comprehensive information about the use of IMIS® software. The manuals can be tailored to suit the individual roles of specific personnel. Isherwoods will print hard copy manuals to specified sizes and with oil and water resistant properties for use in heavy duty areas e.g engine and plant rooms as required. For hard copy manuals and technical publications we can provide special coatings and binders with a consistent print style incorporating customer logos into a full suite of purpose specific manuals. We can supply fully Interactive Electronic Technical Publications. These allow users to quickly find required information via keyword searching and hyperlinks.